Now that the Dungeon Fantasy Roleplaying Game is in shops, you might want to learn more about it before you spend your hard-earned . . . or, if you already have a copy, you may be seeking inspiration from the thinking behind the design. A great place to start would be the five "designer's notes" articles we published on Medium. These came out back in September 2016, around the time of the launch of the Kickstarter, after the books were edited and the rules substantially finalized but before we put the finishing touches on the game. Dungeon Fantasy Designer's Notes 1: What, Who, When, Where, Why? is an overview of the entire process. 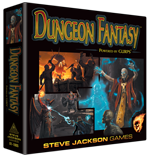 Dungeon Fantasy Designer's Notes 2: Eleven Flavors of Munchkin, a Golf Bag Full of Swords talks about Adventurers, the guide to character creation. Dungeon Fantasy Designer's Notes 3: Fighting (and Other Activities) looks at Exploits, which covers task resolution, dangers, treasures, and GMing. Dungeon Fantasy Designer's Notes 4: "It's Magic!" provides insight into the Spells grimoire. Dungeon Fantasy Designer's Notes 5: Jaws That Bite, Claws That Catch discusses Monsters, the game's bestiary. Pyramid #3/106 is also worth a look, because it contains "Designer's Notes: Dungeon Fantasy Roleplaying Game," written in late June 2017, after everything – including the Dungeon Fantasy GM Screen and Dungeon Fantasy Companion – was as final as could be and off to the printer.